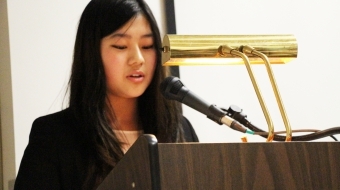 Jacqueline Lee-Tam is a teenage Vancouver writer, spoken-word poet and activist. She's also contributed to the Huffington Post. In June 2014, she was highly photographed by news outlets for appearing at a pipeline rally covered in black-paint in protest of potential oil spills. She has a blog called "Little Miss Oil Spill."